No doubt exhausted from the mental and physical anguish of issuing limp apologies on Twitter for his treatment of actress Hilarie Burton, Ben Affleck has summoned the strength to take on a new friend. I did as the headline suggested and saw the adorable pic! 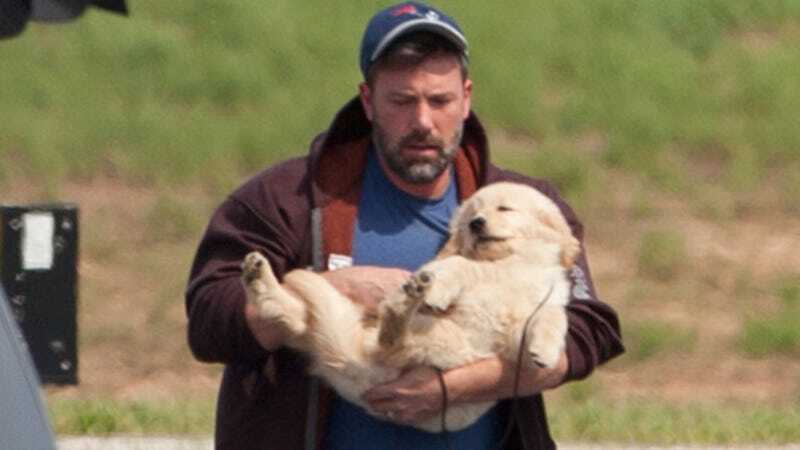 But the pic revealed not only the promised husky, but also something far more distressing: Ben Affleck does not know how to hold a dog. If Ben is indeed an animal fan, please explain to me why he has no idea how to hold a dog. Witness the following photos from 2015, when Ben Affleck brought a dog for his kids on a private plane to Atlanta. Can the dog walk? Does it have full use of all its legs? Does it prefer the comforts of the arms of an aging star? Would it rather be nestled against the barrel chest of this man instead of feeling the soft warmth of asphalt on its tiny paw pads as it experiences true freedom for the last time? Where’s the dog now? Is it okay? Reader, thank you for staying with me. It’s fine.